Kids Love to play outdoors. It doesn’t matter the season, be it winter or summer, they love it. Not only is it fun though, but outdoor play is essential for kids to develop skills and abilities. As well as the obvious health benefits of exercise. Outdoor playsets are a great way for kids to learn skills such as climbing, balancing. They are also good for building confidence, social skills and many other skills that have a meaningful impact on their life. So we have put together a list of the best outdoor playsets for kids, for various age ranges, prices and size. These playsets are all outstanding. 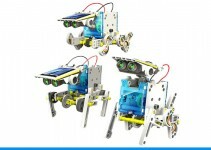 Each of them capable of giving your child and their friends endless hours of play for years. Before we get to the reviews, here are some things to consider before buying an outdoor playset for kids. You should always read and follow the manufacturer’s guidelines for age and weight restrictions. On many outdoor playsets for kids, a total weight restriction is given for the whole play set, and then, weight restrictions are given for individual features. The age restrictions for most play sets is from three years old to ten or 12 years old. You may find that three year olds are not able to use some features on some play sets safely. So, parental supervision is recommended for younger children. Here are some tips to make a play set as safe as possible for your children. To protect your children from injuries if they fall, cover the ground under and six feet around the play set with 6 to 12 inches of rubberized mulch, bark, play sand, or pea gravel. The best amount actually is 9 to 12 inches, and it will have to be replenished as it settles. Make sure that your children are safe from being caught in any openings in the play set. Openings that are above the ground should be larger than 9.5″ or smaller than 3″. There should be railings on decks that are more than 30″ off the ground. Swings that rotate, such as tire swings, should have extra room. Swings and other accessories should not be hung from the monkey bars. Check the play set regularly for loose or missing pieces, cracks, damage, or peeling paint. Tighten all bolts on a monthly basis. On warm days, make sure that the slide is not too hot. If you are not experienced at assembling things like play sets or may not be able to tighten connections well, you may want to hire someone to assemble the play set. Follow the manufacturer’s care and maintenance instructions. Give the play set an annual power wash in the spring, and if recommended for a wood play set, apply a sealant at least every two years. Even if your child is younger and cannot use some of the features now, the best outdoor playsets for kids will last for seven to ten years, so buy one your child can use in the future. 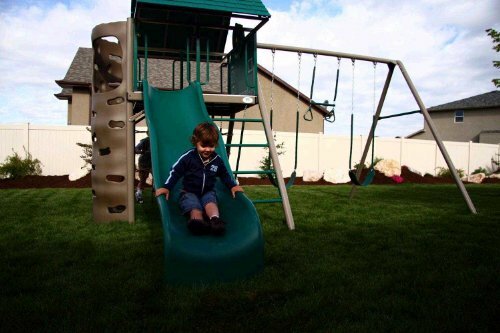 If choosing between sets that have current fad features, such as rock-climbing walls, and classic features, such as swings and slides, choose the classic features. Choose cedar or redwood because they do not have chemicals added like pressure-treated pine does. Cedar and redwood are also more rot-resistant and decay-resistant. Most children can stand on their own at ten months. Between 13 and 18 months, children can climb stairs. Between 18 to 24 months, they start running short distances. So, two year olds can generally walk, run, and manage stairs with more adult-like movement. By three years old, children can pedal a tricycle. However, as mentioned earlier, your child may not be quite ready to safely manage some features of some play sets, and they can be unaware of the dangers of some actions. So, again, parental supervision is recommended for younger children. The IMAGE Spider Web Swing seat is 40″ in diameter, and comes with adjustable nylon ropes so that you can adjust the height of the swing. The seat’s steel frame is padded with ethylene-vinyl acetate (EVA), and comes in four pieces that need to be assembled. The seat and the ropes provide a comfortable swing for children. It can be hung from a tree or a swing frame. Make sure the tree branch or swing frame is sturdy enough to hold it. The wrench and screws provided with the swing make installation quick and easy. The swing can also be easily detached and stored to keep it out of the elements so that it will last longer. 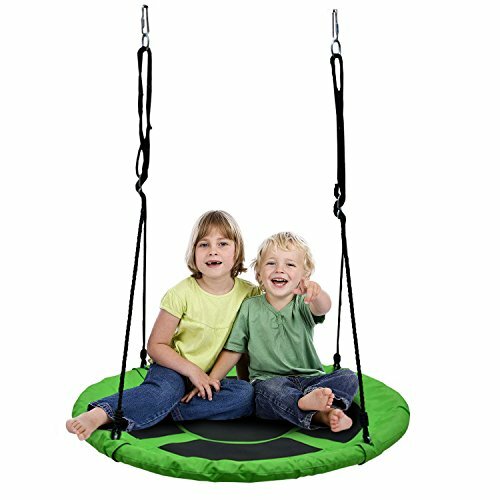 The IMAGE Spider Web Swing is for children ages two and up, and the maximum weight load is 220 pounds. It is best if your child can sit up on their own and knows to hold on to the swing ropes. It is recommended that younger children be supervised by an adult. They may also need help getting on the swing. 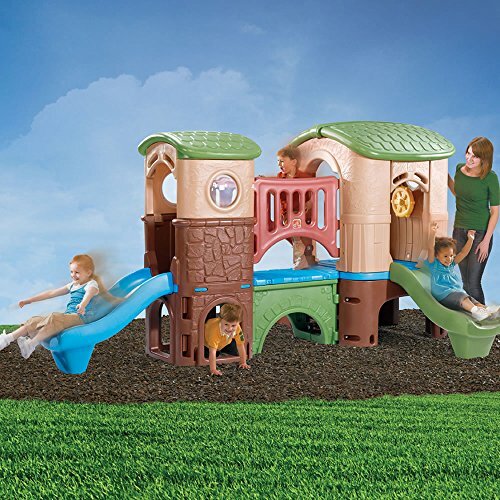 The Step2 All Around Playtime Patio with Canopy Playhouse has activity centers on three sides. There is a grill with a knob that clicks and a sink with a faucet that swivels. Your children can grill shish kebabs made with plastic meat, cheese, and vegetables that slide on plastic skewers. There is also a bowl, a pan and a skillet both with lids, tongs, a spatula, some peppers, and some bananas. On the other side is a counter that resembles a picnic table with cup holders. There are two plates and two cups to use for a play meal. On the back, there are tubs for sand and water fun with covers provided for when the tubs are not being used. The water tub has a plug so that you can drain it. There is a dual-headed sand tool with a shovel at one end an a rake on the other and a water tower with a water wheel. The playhouse has swinging doors, a canopy, measures 47.5″ x 47.5″ x 60″, and weighs 40 pounds. 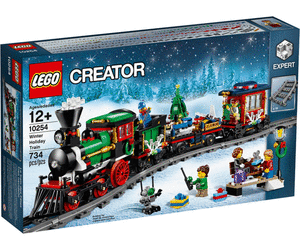 It is intended for children from two to eight years old and requires some assembly. Two year olds are able to walk well. So, this playhouse will encourage them to move around all sides so that they further develop their gross motor skills. 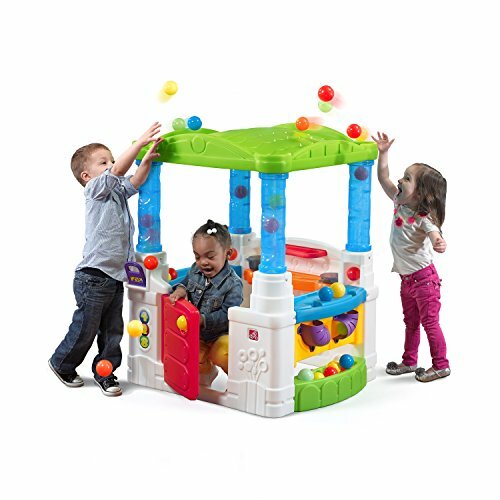 Since there is no climbing features with this playhouse, younger children can play with it with less close supervision. 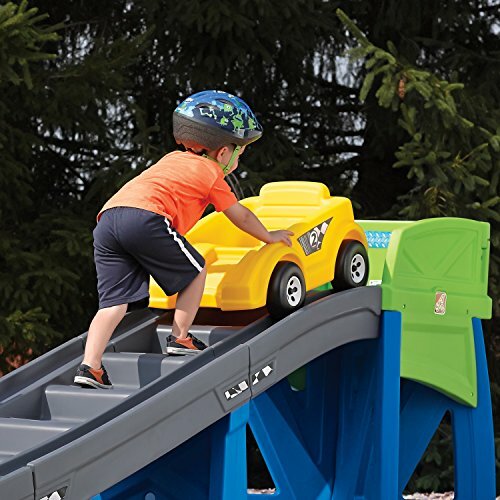 The Step2 Extreme Roller Coaster Ride-On Playset has a 30″ high platform and a nine-foot track. The car allows easy entry for one child to ride at a time. For safety, the play set has rails, hand grips on the car, a high seat back, footrests, and steps that children can climb to push the car back to the top of the platform. Pushing the car to the platform helps children develop strength and coordination. It also teaches teamwork and provides an opportunity to learn about taking turns. Depending on the ground surface and slope, the car will go several feet or more past the end of the track. Parental supervision, especially for younger children, is recommended because of returning the car to the start and the distance the car may roll before it stops. Bike helmets are also recommended, but not included. 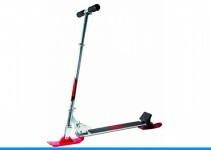 It is designed for children three to eight years old under 75 pounds. 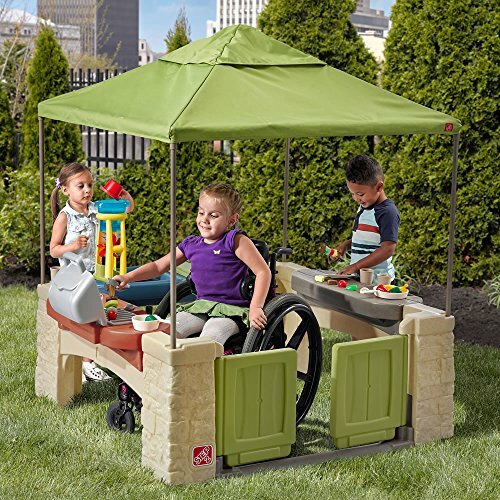 The play set is made with durable poly material, measures 30.5″ x 132.8″ x 40.8″, weighs 34.1 pounds, and requires assembly. Once assembled, this really is one of the best outdoor playsets for kids of the younger age range. The Step2 Skyward Summit is 80-inches tall with a different climbing surface on each side including two cargo nets, nine hand grips, anchors for the swing set and trampoline, and an inside deck near the top with a net floor and a hole to peak out of the top. It has an area underneath that children can use as a play area. The Step2 Skyward Summit is intended for children from four to eight years old. Four year olds should have the gross motor skills to manage to climb at least part way. Adult supervision is recommended for younger children to be sure that they stay within safe boundaries while playing. There is a total limit of four children with a maximum weight of 320 pounds, and only one child on the upper deck with a maximum weight of 80 pounds. The Step2 Skyward Summit measures 52″ deep x 80″ wide x 80″ high, weighs 138 pounds, assembly is required. 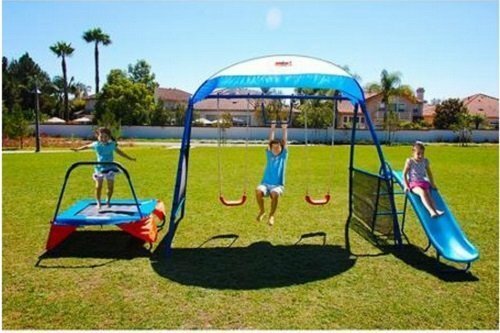 The Ironkids Kids Outdoor Playground frame is made of powder-coated tubular steel and features two swings, a slide, a 42″ trampoline with handle safety bar, a monkey bar, and a partial canopy that covers the swings and the monkey bar. The slide and the swing seats are polypropylene plastic. The swings and the trampoline are for children from three to eight years old and up to 100 pounds. The maximum weight limit for the complete swing set is 600 pounds. It measures 13’6″ long x 6’6″ wide x 6’5″ high or 10’3″ wide with the slide and 8′ high with canopy. It weighs 116 pounds. The recommended safety zone is 18’6″ long x 16’3″ wide x 14′ high. While having fun, children are getting exercise, developing coordination, and strengthening muscles. They are also learning to share and developing social interaction skills. Different features, such as the monkey bars and the trampoline, might be better for older children. So, parental supervision is recommended for younger children. The Step2 Clubhouse Climber has steps with handrails to a pilothouse with two windows, a steering wheel, and a skylight. Then, you cross a bridge to the look-out tower with two slides. The slides are approximately three feet high and four feet long. Underneath there is a play area. It is for children from two to six years old with a total maximum weight of 240 pounds. The Step2 Clubhouse Climber is made from plastic, measures 70″ high x 137″ long x 91.5” wide, and weighs 214 pounds. This is recommended for two year olds who can climb stairs. However, for safety, parental supervision is recommended for younger children. The Backyard Discovery Tanglewood Cedar Play Set has a club room on the ground level. The club room has a snack window with a bench on the outside. Above the club house is a fort that is accessed by a rock climbing wall. The upper fort has an observation porch and an eight-foot slide to exit from the fort. The swing set has two belt swings and a two-person glider swing. The play set is made from pre-cut, pre-drilled, pre-stained, 100-percent small-knot cedar that produces less cracks. The stain is chemical-free. You may have to drill some pilot holes. The cedar is rot-resistant and decay-resistant. Part numbers are stamped on the wood pieces. The Safe-T-Fuse hardware includes high-strength steel brackets with a powder coating for maximum protection from the weather and locking nuts that do not loosen over time. The nuts have rounded surfaces for safety. The swing set beam is laminated and built with steel clam-shell brackets. Plastic pieces are UV-resistant. This play set will take 18 to 24 hours for two moderately skill people to build. The play set requires a level 26′ long x 24′ wide space. It measures 12′ deep x 14′ 7″ wide x 8′ 10″ high and weighs 356 pounds. The upper deck is 49″ x 45″ and 4′ from the ground. 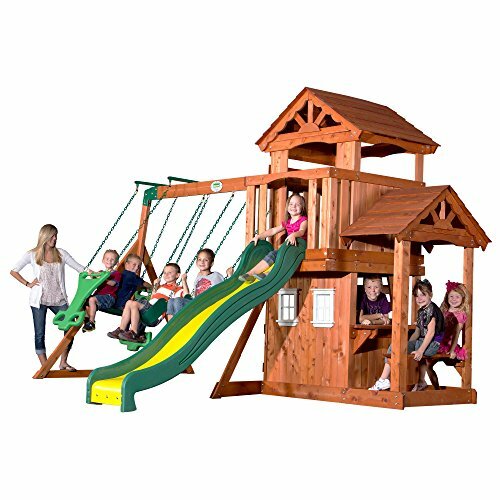 The Backyard Discovery Tanglewood Cedar Play Set is ASTM compliant and can be used by up to eight children from three to eight years old, who are less than 150 pounds each. Although, three year olds should be able to master the features on this play set, parental supervision is recommended for younger children. 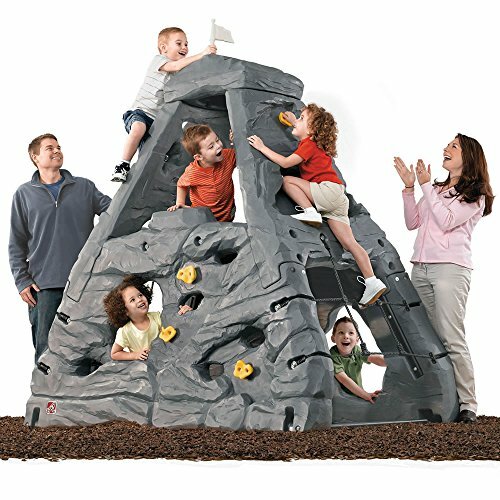 The Lifetime Big Stuff Adventure Play Set features a climbing wall and a cargo net that provide access to a clubhouse with a ship’s wheel, binoculars, activity board, and nine-foot wavy slide. The clubhouse has marine-quality decking and a heavy-duty roof. To the right of the slide is a swing set with two heavy-duty molded swings, a propeller swing, and a trapeze bar with gym rings. It is intended for children from the three to 12 year olds. This play set is made of UV-protected, high-density polyethylene (HDPE) and powder-coated steel that will not rot, crack, warp, or splinter. The Lifetime Big Stuff Adventure Play Set exceeds playground performance and safety standards. Plastic caps cover edges or the edges are rounded. To prevent pinched fingers, the rust-resistant, zinc-coated swing chains have soft rubber grips. It measures 13′ 11″ x 15′ 9″, weighs 677 pounds, requires no anchoring or cement, and offers a five-year limited warrant. With a climbing wall, a cargo net, and a trapeze bar included on this play set, three year olds could find parts of this play set challenging. So, parental supervision is recommended for younger children. 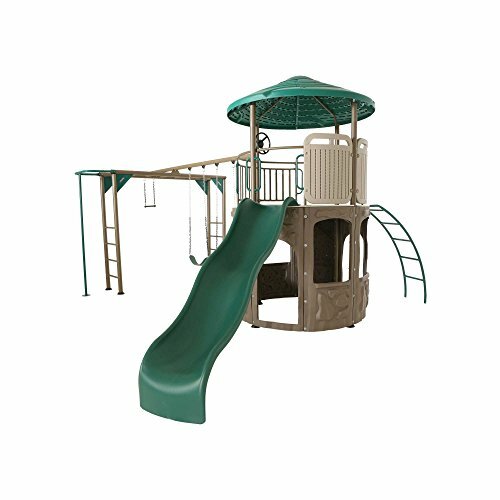 The Lifetime Products Adventure Tower Deluxe Playset features a five-foot curved ladder that accesses a lookout tower with a steering wheel and a nine-foot wavy slide. Two climbing walls also access the tower. Under the tower, there is a play area with two doors, four windows, a sandbox, and two chalkboards. To the left of the tower is a swing set with two swings. At the end, there are monkey bars, a fireman’s pole, and a steel trapeze bar. 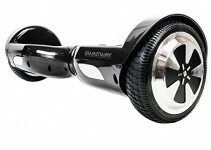 It is intended for up to ten children from three to 12 years old with a maximum weight of 1,600 pounds. The maximum weight capacity for the slide is 150 pounds, for the swings 140 pounds, and for the trapeze 140 pounds. The powder-coated steel frame and the UV-protected, high-density polyethylene (HDPE) parts will not warp, crack, rot, or splinter. It measures 16′ 3 ” x 16 ‘ 3″ x 7’ 9″ high, weighs 500 pounds, has two anchors for the tower, a bar to anchor the fireman’s pole, requires no other anchoring or cement, and offers a five-year limited warranty. While three year olds might be able to climb a straight ladder, the curved ladder could be a bit risky. Parental supervision is recommended for younger children. 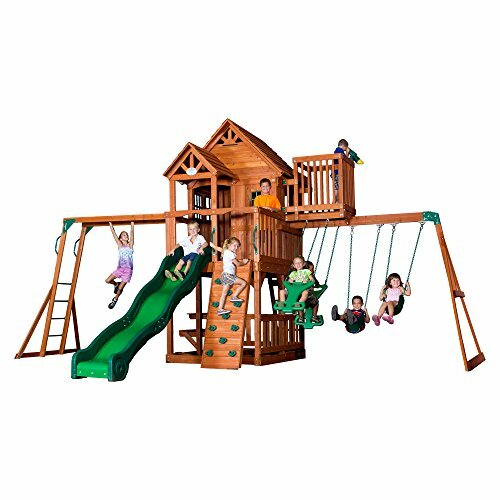 The Backyard Discovery Skyfort II All Cedar Wood Swing Set has a two-story tower in the center. At the top of the tower is a clubhouse with a covered doorway, windows including a bay window, a front porch, a crow’s nest with a telescope, and a ten-foot wavy slide. Children can access the clubhouse from a ladder or climbing wall. Underneath the clubhouse is a play area with picnic table and sandbox. To the left of the tower are monkey bars. To the right of the tower is a swing set with a belt swing and a two-person glider swing. Made from 100-percent small-knot cedar, the Backyard Discovery Skyfort II Swing Set will not crack, rot, or decay. Plastic parts are UV-resistant. Parts numbers are stamped onto pieces. The pieces are pre-cut and pre-stained but may need to have some pilot holes drilled. It is made with Safe-T-Fuse locking nuts so that it doesn’t loosen, snag clothing, or scrape children’s hands. Powdered-coated steel brackets strengthen joints. The swing beam is laminated and uses steel clam-shell brackets for safety. It measures 21′ 11″ x 16′ x 8 1/2″ and weighs 720 pounds. It meets or exceeds ASTM Standards. This outdoor playset is recommended for three to 12 year olds. However, the monkey bars could be beyond the physical development of three year olds. So, adult supervision is recommended for younger children.